2017 marked Canon’s 80th anniversary. It was an epoch-making year in which we continued Phase V of our Excellent Global Corporation Plan (2016 – 2020) and established a strong foundation for the grand strategic transformation of our business portfolio. Between our existing businesses, which have continually supported us with solid earnings, and the expansion of our new businesses that will drive future growth, our sales exceeded 4 trillion yen ($36.1 billion*) for the first time since the financial crisis of 2008. Furthermore, for the first time in four years, we registered an increase in both sales and profits. Toward achieving our grand strategic transformation, we are focused on our four new businesses of commercial printing, network cameras, healthcare and industrial equipment. Through collaboration with Group company Océ, our commercial printing business is growing to meet the diversifying needs of the expanding digital printing market. In our network camera business, which is growing mainly in the areas of security and surveillance, we are achieving synergies with Group companies Axis and Milestone Systems, enabling us to propose network visual solutions based on a combination of superior technologies in such areas as video content analysis. Our work in healthcare centers on Canon Medical Systems, which joined the Canon Group in December 2016 as Toshiba Medical Systems and adopted its new name in January 2018. We are expanding our business in diagnostic imaging, healthcare IT and in-vitro diagnostic systems. Lastly, in our industrial equipment business—which includes Canon Tokki, the market leader in Organic LED (OLED) panel manufacturing equipment—we are combining our strengths from across the entire Canon Group to develop new manufacturing systems that will play a vital role in next-generation manufacturing. With the advancement of such IT technologies as the IoT, big data and AI, the world is on the cusp of a revolution in product usage and manufacturing methods. While continuing to pursue innovation in such longstanding business segments as cameras, inkjet printers and office multifunction devices, we are striving to improve productivity through automation and in-house development of software. Since Canon’s foundation, we have continued to pass down our corporate DNA of enterprising spirit and the San-ji, or "Three Selfs," Spirit. 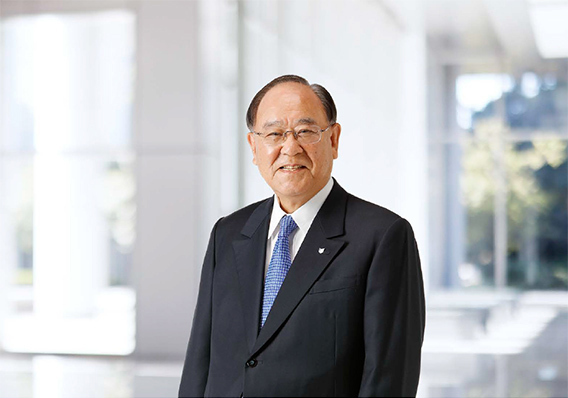 And under our corporate philosophy of kyosei, we seek to become a truly excellent company that is admired and respected around the world. Toward this end, we will continue working together as a Group to become an Excellent Global Corporation of the highest order.